Imagine cooking a meal in a space slightly smaller than your downstairs loo. The sink is half its normal size, there are only 2 rings on the cooker, and the working surface doubles up as the lid of a top-opening fridge. Add to that the fact that anything you put down on the work surface may shake, rattle, or roll, and you may wonder how it is possible to produce anything remotely edible! 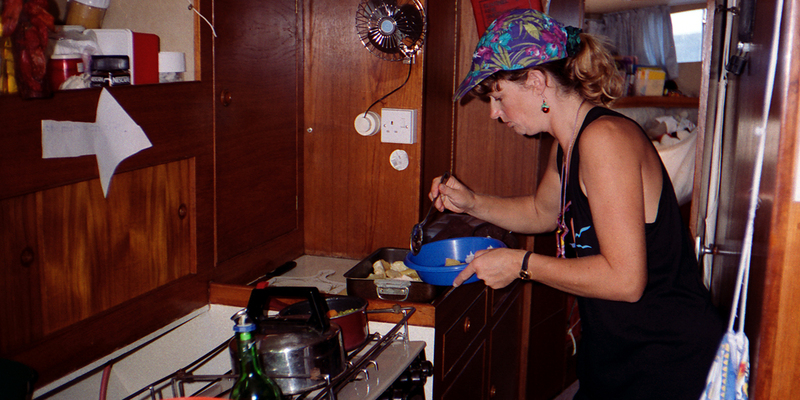 Preparation has to be one of the key factors in producing a decent meal onboard. I make sure all ingredients are easily accessible, although in a secure place if sailing at the time. A sure-fire way to start feeling green around the gills is to go rummaging around in a locker up front, trying to find an elusive tin of tomatoes while the boat is going up and down in a 6 foot chop. I also take all the items I need out of my top-opening fridge before starting, as the work surface is a vital area in preparing a meal (that also includes getting out a cold beer for myself). Having things ready before starting the meal also helps when entertaining onboard. Most boats have limited space down below, and there is nothing worse than having to move guests around while you hunt through lockers behind or beneath seating areas. 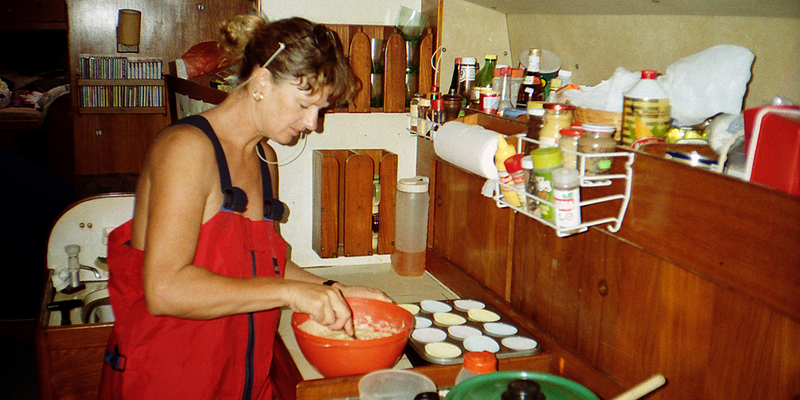 It can get pretty hot and steamy down in the galley, especially in the tropics, and you may not feel much like cooking at all. I limit main meals to a few different items e.g. baked fish with jacket potatoes and a green salad, rather than a roast with four veg. and all the trimmings. A quick snack can often be made from food left-over from a previous meal. Think about boiling a few extra potatoes to make a salad, an extra handful of rice for a stir-fry, or save some cooked chicken for a sandwich. Some people completely change their eating habits and eat their main meal at lunchtime, and just having a sandwich or light snack in the evening. I must say this has never worked well for us, as the evening meal is a time for us to sit together and discuss what we've done, and what we plan for the next day. The Recipes are organised into categories, alternatively you can use the Search box at the top of the screen to find a particular recipe. A version of this cookbook is available in pdf format on our Downloads page - it works well in an iPad or similar.